Last week in this space I reviewed my three DraftKings WildCat entries. 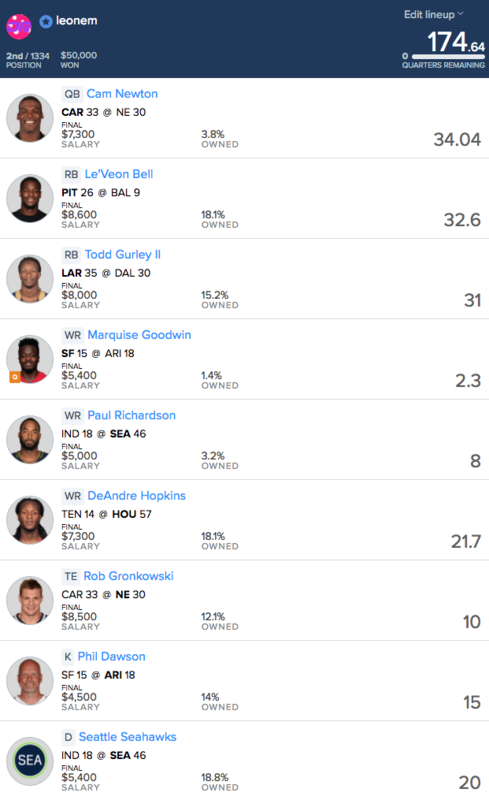 This week I want to take a look at my GPP entries on FanDuel. I entered three teams into the FanDuel Monster ($333 entry) and one team into the Luxury Box ($540). 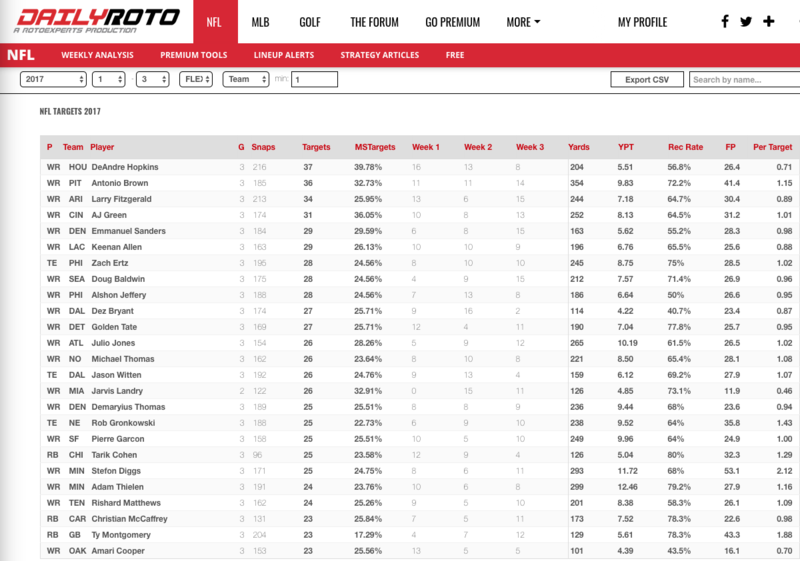 This article helps outline my NFL DFS Strategy for approaching tournaments. Before delving into my specific lineups, here are the concepts I was focusing on when setting my teams Sunday morning. Smart contrarian can be an oxymoron since going contrarian often means going against the smart plays, so let me explain what I mean by this. These tournaments on FanDuel are somewhat top heavy, but they also pay out nearly 2x and nearly 20% of the field. So, I wanted to create teams with enough leverage or ceiling to win tournaments without sacrificing too much value, crushing my min-cash probabilities on low-probability plays (position depending). Now, I realize that's a bit vague so I'll gradually get more specific. One of the best ways I've found to create leverage in tournaments that A) aren't massive sized fields like milly maker contests and B) you don't have a lot of entries in is to fade or go underweight on the chalk. I'd rather be light on chalk as a way to make my lineups unique than find myself dependent on several plays that are sub-1% owned because of the low likelihood of hitting. My goal was not to force a full fade on these players but to make sure I didn't go overweight (didn't use any of these players on more than one team). Again, the idea being that I didn't want to dismiss strong values solely on the basis of ownership and sabotage my min cash chances, but I did want to side on being exposed to high ceiling pivots at lower ownership numbers. That feeds into the next two sections. I won't spend too much time on this section, as the rationale between diversifying rosters is in lockstep with my smart contrarian rationale. As Drew and I have mentioned on the podcast the last two weeks, pricing on both sites has been pretty good. It's been tighter on DK than on FD, but even on FD the gaps in value between players has been small. I wanted my rosters to account for the fragility of our value rankings by not going too heavy on a single player, allowing me to A) not have my whole day sunk by one bad performance and B) force myself to get exposure to multiple players with upside. Similar to smart contrarian, this approach allowed me to be naturally underweight on chalk and overweight on pivots, resulting in lineups that hypothetically had a higher ceiling than the average lineup but enough value to keep min cashes firmly in play. It's obvious you want to focus on ceiling in tournaments, but I was especially conscious of fitting in certain players I felt would be under-owned given their high-end outcome potential. At RB, this meant I was particularly interested in Todd Gurley, Le'Veon Bell, and LeSean McCoy. None of these players were going to be sub-5% type plays, but all were likely to come with modest ownership potential. If I was right on ownership, they were straight line pivots to the main chalk (Elliott) and would result in different roster construction than complementing a high priced RB with one of the two popular value plays (Mixon and Carson). Elliott was the safest and best expensive RB in a value, but given the crazy usage of Le'Veon Bell and Todd Gurley (whose workload value we outlined in the Thursday Cliff Notes), I felt the ceilings were all almost the same. It also helped that our projections were lukewarm on Mixon and Carson and dictated roster construction around pricier backs with better overall projections. At WR, I wanted to make sure to grab at least one share of our top four projected values: AJ Green, Larry Fitzgerald, Keenan Allen, and Julio Jones. After that, I was focused on players I felt had underrated ceilings. When looking at Hopkins with a “most likely scenario” in mind, you'd expect the efficiency to rise (just 5.51 YPT) and the volume to wane. However, if you viewed him from purely an upside standpoint, the question shifts to: “What if he maintains similar volume and the efficiency improves to his career marks?”. If that happens, you hit gold. With Thielen, I was hoping his awesome efficiency (carried over from last season) could meet more volume in the chance that Darius Slay shadowed Stefon Diggs, resulting in more targets for the rest of the Minnesota offense. Richardson had by far the lowest ceiling of the group, but he came at a near punt price, and the opportunity cost on FD is a little lower on cheap WRs because of the half PPR scoring. I expected a strong offensive performance out of the Seahawks, and with Doug Baldwin nursing a groin injury, I saw an opportunity to land an okay play in Richardson, who could become a great play if Baldwin was out or limited. Since it was the night game and news around Baldwin was still uncertain, ownership wasn't going to reflect the potential reward. Generally, I am more concerned about correlation on DK than on FD. There are a few reasons for this, but the main reason is the scoring systems. On DK, the full PPR scoring and 100-yard bonuses increase the ceiling of hitting on a stack, whether it's a pass catcher connecting with your QB or two opposing pass catchers benefiting from a shootout (increased plays, increased scoring, etc.). On FD, half PPR scoring and no bonuses reduce the need to pack in correlation at every turn, since the payoff isn't as rewarding. Adding to this thought process - the looser pricing and lack of a FLEX on FD subtly reduce the importance of stacking. 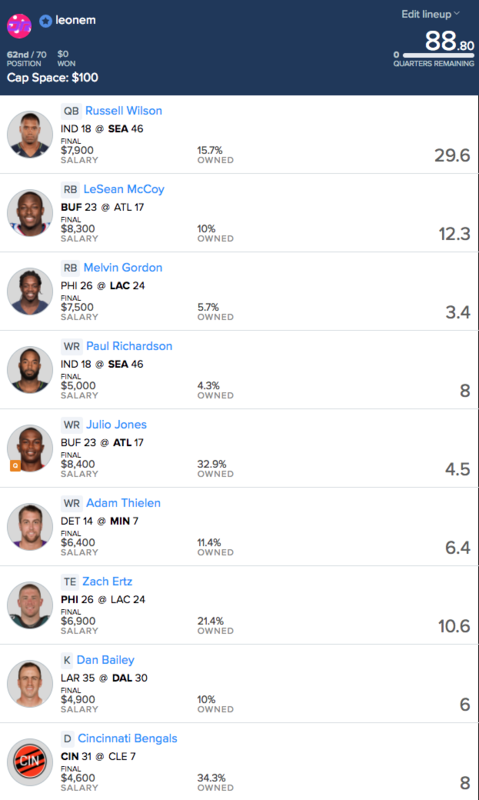 Finally, since I'm generally stacking all my DK GPP lineups (usually a combination of both QB-pass catcher and opposition skill player coming back), by not forcing correlation on FD, I'm able to naturally diversify across sites. This is not intended to read in a way that suggests you should avoid stacking on FD. It still makes sense to take correlation where it makes sense. In fact, you'll see I made a near catastrophic error on one of my teams by not stacking where it was logical and unforced. All I'm saying here is that I'm less concerned about forcing stacking on FD. I'll grab correlation where it makes sense, but it's not the basis for making lineups as it can be for me on DK. 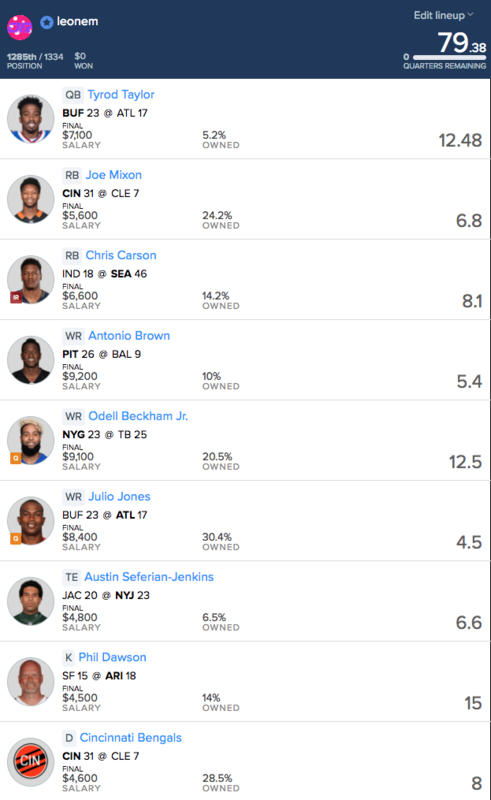 My diversification/smart contrarian strategy, some solid projections, and a good deal of luck allowed me to take home second in the FD Monster for a big score. Despite having an average score that was modest across all my lineups, my diversified lineups had a wide distribution of scores, ranging from terrible (finished 62/70 with an 88.8 in the Luxury Box) to great (finished 2/1,334 with a score of 174.6 in the Monster). NOTE: Simply diversifying is not going to always lead to such a distribution. On DK, my average scores across 7 tournament teams were actually comparable in terms of percentile, but I failed to cash any of those teams since hits and landmines intertwined, leading to 6 of my 7 teams scoring between 132 and 144 points). Aside from the distribution of scores, I was happy with the way my plan came together. My winning roster had our second and third-ranked value RBs (Gurley and Bell) at a combined ownership similar to Elliott's alone. As I said I would in our Sunday morning premium NFL chat, I grabbed a share of Cam Newton. There were plenty of concerns around Newton, but again, I tried to focus simply on ceiling and couldn't resist sub-5% ownership on a historically high ceiling player against the league's worst defense through the first three weeks. I also had a team that min cashed by utilizing our top three WR values, second highest TE value, second and fourth highest RB values, and second highest QB value. 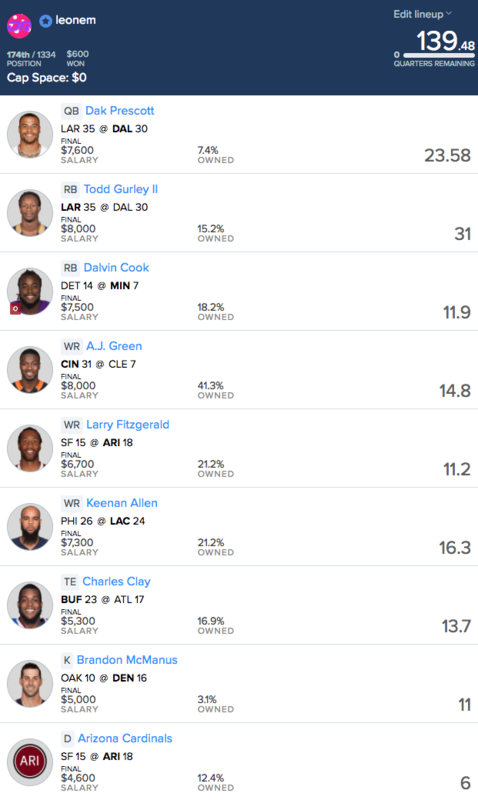 I swallowed some chalk on this team, but I wasn't intending on full fading the chalk - by focusing on exposure to top values in different combinations I was able to maintain min cash equity on most of my teams. My worst team was also in the FD Monster. I diversified with this team, swallowing what I thought would be value RB chalk on the same team and grabbing ceiling by loading up at the WR position. While this team failed in a big way, it meshed well with my plan. I was a little off on identifying chalk. Chris Carson wasn't as heavily owned as I anticipated, and admittedly I may have doubled up on him had I known the ownership. Conversely, I thought the Julio Jones ownership would be spread out among Beckham and Brown, or I would not have doubled up on him. I failed to grab an Ezekiel Elliott team. I had not intended to fully fade him, and using him somewhere would have increased my chances of min cashing somewhere. He simply didn't fit, and I liked the teams I rolled out. The biggest mistake, though, was failing to take correlation in a spot where it was unforced, and it nearly cost me dearly. On my second place Monster team, I could have played Devin Funchess ($5,400) over Marquise Goodwin at the same price. While I had good reasons for playing Goodwin (air yards indicated big-play potential, hope that volume would increase with Patrick Peterson on Pierre Garcon), when two options are projected similarly, you take the correlation. To make matters worse, we actually had Funchess projected clearly better than Goodwin. This was just an old-fashioned mental lapse. Newton went off, throwing two TDs to Funchess, and the straight swap from Goodwin to Funchess would have netted me 20 more points. Unfathomably, the move didn't cost me a single penny since first place finished more than 20 points ahead of me. First, fading the chalk has its advantages. I hit a landmine on my second place team, got a pedestrian performance out of Paul Richardson, and a very underwhelming performance from Rob Gronkowski and was still able to walk away with a big payday in large part because Joe Mixon and Julio Jones busted, AJ Green and Larry Fitzgerald were good but not great, and Bell and Gurley outscored Elliott. This reiterates one of my focuses in tournaments like this: fading the chalk is a way better way to create leverage than surrounding chalk with multiple outlandish plays. Secondly, especially in tournaments, don't be afraid to make some leaps of faith based on small sample sizes. Quite frankly, the entire NFL season is a small sample. My winning roster involved trusting the hefty volume of Todd Gurley and DeAndre Hopkins and seeing recently dominated defenses get dominated again (Tennessee and New England). At the end of the day, I won more than I probably deserved to win (thank you two Seattle D TDs on Sunday Night Football), but I was happy with the way I was able to intertwine the DailyRoto premium projections and tools with my macro tournament strategy. It's less about being perfect, and more about putting yourself in positions where you could reasonably get lucky.